The salaried class in India puts a portion of their pay in to the Employee Provident Fund(EPF). 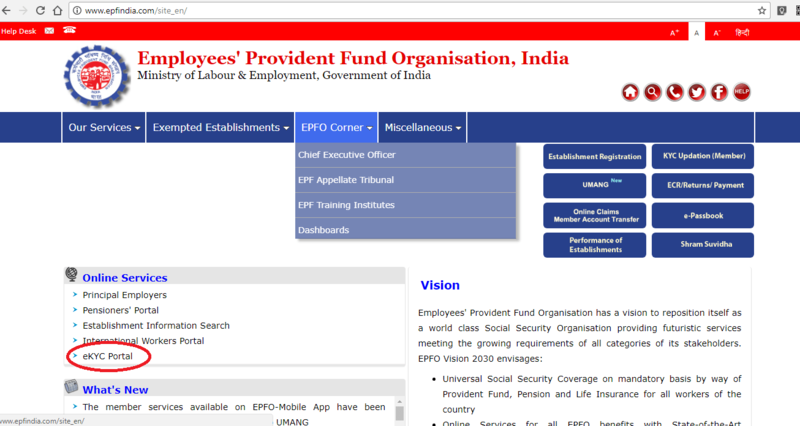 The EPF is handled by the Employee Provident fund Organisation(EPFO). An employee does this month after month, till he/she retires. And once they retire, they go through all the hassles while withdrawing the accumulated corpus. The hassles are increased due to the lack of professionalism among the various people involved in these processes. Often we read in the news that there have been delays ranging from a few months to few years in service. But the EPFO seems to have changed their approached towards the way they need to work in future. There seems to be some apparent movement towards digitization. Though the progress is very slow, if the EPFO doesn’t lose track of their goal, they should achieve it by the time I retire. One of the key requirement for any money related transaction in India is to be compliant with the ‘Know Your Customer'(KYC) norms. Any institution dealing with finances or any organisation dealing with goods/services which could pose a threat to national security, is required to have a thorough knowledge and records of their customers/clients. The records which they normally maintain contain identity proof and address proof along with Permanent Account number(PAN) for financial concerns. 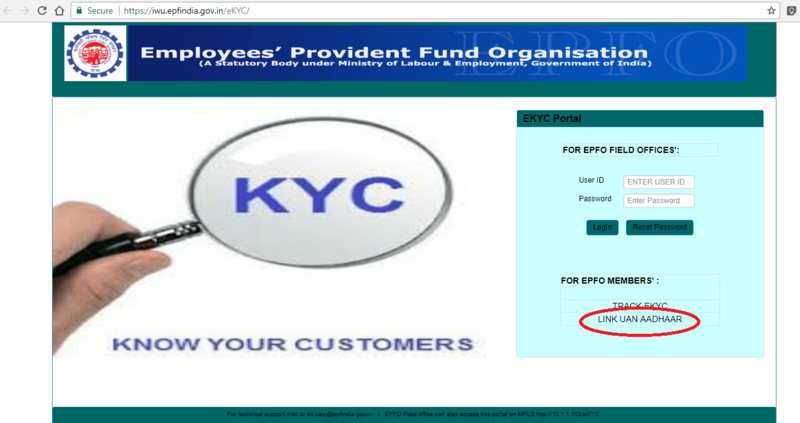 EPFO had taken up drive in past to update the KYC for its existing members. New members are not allowed to open accounts without producing the proper KYC prescribed documents. Aadhaar is one of the important KYC document among them. But even then, the process didn’t yield the expected outcome. Most of the times, due to lack of professional approach or due to neglect many details are not entered while creating the PF account. And even after the KYC details are updated in the database, they need to be authorised by the employer. This doesn’t happen in many cases and thus the future processes in PF account get delayed. But now, EPFO has decided to use Aadhaar the way it should be used. They have started the facility of completing eKYC by employees using Aadhaar. 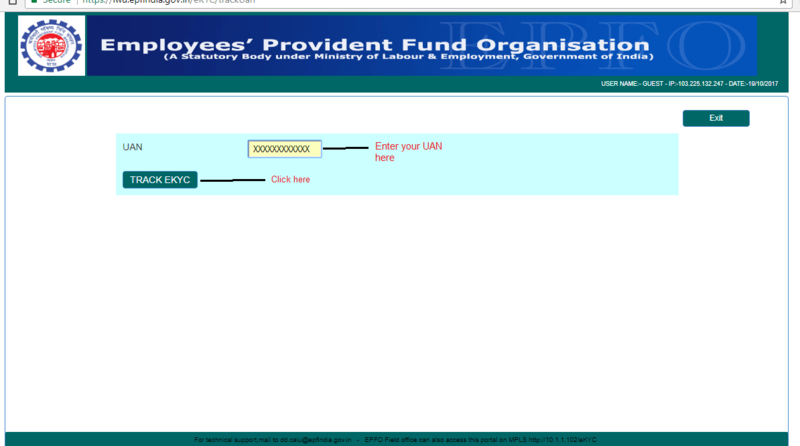 Using this method, the employee can do the KYC himself/herself without relying on the employer. The verification for this eKYC is done through central UIDAI servers which contain all the details of the Aadhaar card holders. That’s one less burden for the employer and quick EPF KYC for the employee. Prerequisites : For linking your Aadhaar to UAN and completing the eKYC you need to have a UAN alloted to you. Also, a phone number should be linked to this UAN for OTP. So here’s how you do it. 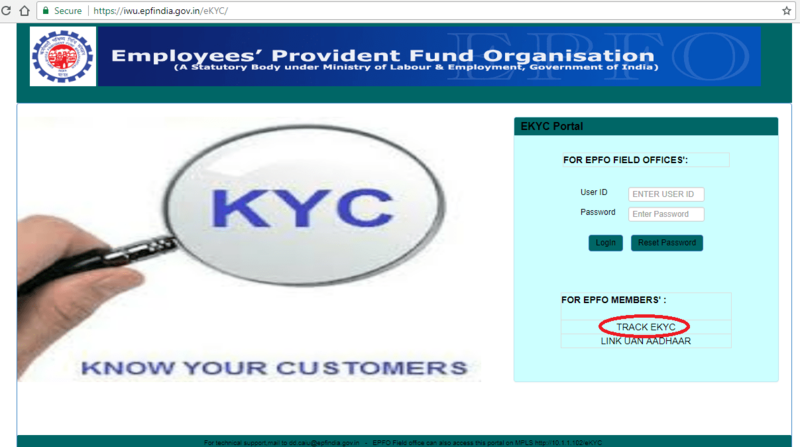 Click on the eKYC as encircled below. On the next page, enter your UAN in the box provided. Once you fill in the UAN and click enter, the website will fetch your UAN linked phone number automatically and fill in the space provided. You will see only the last four digits of the phone number. 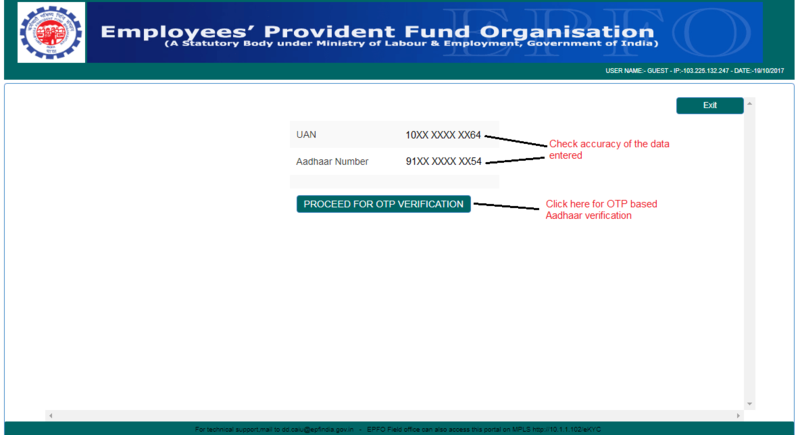 Once the phone number is displayed, click on “GENERATE OTP”. You will receive the OTP on your mobile. 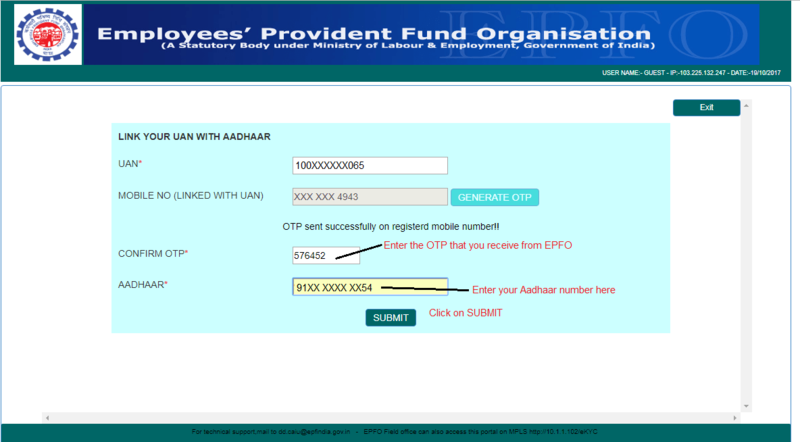 Enter the OTP and your Aadhaar number and click on “SUBMIT” button. The website will redirect you to E-Governence Service page. Here, select the method of OTP channel you wish to use. It can be either email or phone number, whichever is linked to your Aadhaar. Note that this OTP is for Aadhaar verification. Click on “GENERATE OTP”. You will receive OTP via the channel which you selected. Enter the OTP in the box given and click on “Validate OTP”. Assuming you have done all the steps right, you will receive a confirmation message on the screen. The message will inform that the Aadhaar details have been verified. The update doesn’t happen immediately. Once you have done the eKYC, you can track the status anytime using the second option on the eKYC landing page. See the steps in below graphics. I am a bit worried even though the process seems straight forward. Ideally, e-verification of Aadhaar should have been sufficient to determine ownership. But the status message says it will be updated by the next day. I hope they have not employed someone to view the number on one computer monitor and feed it on another monitor in their internal application. That will be a disaster at multiple levels.